I had met the owner in a cooking class recently and she graciously invited us to visit the foundry. She showed us their various models many of which have been in various movies: Lonesome Dove, Dances with Wolves and Quigley Down Under. The one that caught my eye was the '1863'. She went on to mention this style rifle was a major turning point in the war. My memory of that lecture in History 301 was the superior manufacturing capacity and the rail lines/rolling stock were the big advantages for the North. Now I need to add Sharps Rifles to the list. There were examples of the paper cartridges used in these rifles and we had the opportunity to handle the rifle and load in a cartridge. Although neither Ron nor I no longer hunt, we both enjoyed seeing these rifles. 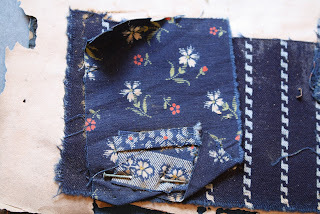 While Shiloh Sharps is supplying rifles to movies, I am selling them reproduction fabrics! A sample from my 1863 book. Here is some general information on this style of rifle. The Sharps Rifle was produced by the Sharps Rifle Manufacturing Company in Hartford, Connecticut. It was used in the Civil War by the United States Army sharpshooters, known popularly as Berdan's Sharpshooters in honor of their leader Hiram Berdan. The Sharps made a superior sniper weapon of greater accuracy than the more commonly issued Muzzle loaders. This was due mainly to the higher rate of fire of the Breech-loading mechanism and the superior quality of manufacture of the guns. I have been reading about Orientalism recently ( Orientalism, Visions of the East in Western Dress, Metropolitan Museum of Art and Noble Dreams Wicked Pleasures Orientalism in America 1870-1930, Sterling and Francine Clark Art Institute). 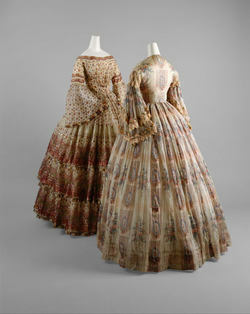 One of the dresses in the Metropolitan book/exhibit caught my eye. The dress is French and dated c. 1855. The fabric is cotton gauze. 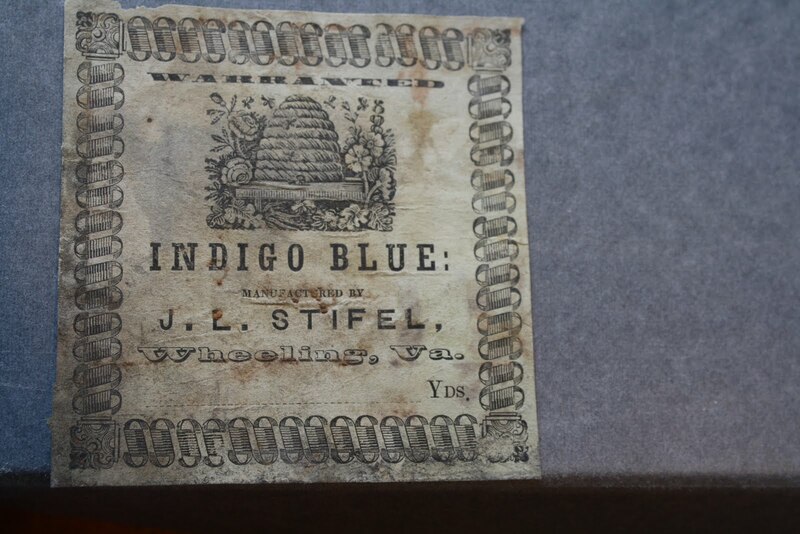 The image to the left is from one of my sample books dated 1843. The fabric is gauze with woven satin stripes and the designs have a similar look. These prints were some of the most expensive goods of their times. The process began with a 2-step resist, which produced both white and a light blue print on a deep blue background--aka 'two blues'. Once all of the original resists were removed, new areas were covered with another resist paste. The fabric was then dyed yellow, giving three additional colors: yellow, green and black. Finally pink and red could be overprinted. The result was a polychrome print which could feature white and lgiht blue on a dark background with touches of yellow, green, black, red, pink and brown. Wow--this was 1830s printing technology! 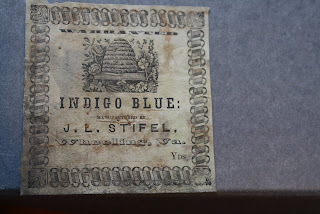 Here are 2 images from the Stifel archives in Wheeling, WV. The first is an early label--note the state! The second is a polychrome indigo. We have real hope for some nice weather starting a midnight Saturday. The plan is to leave early am Sunday with our kayaks for two days of paddling! 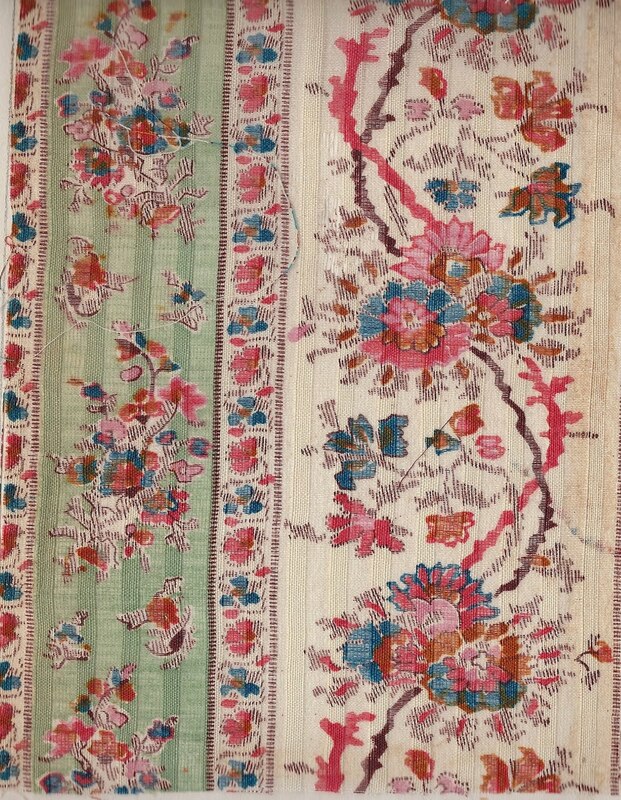 The English East India Company introduced the British to the wonders of colorful, washable cottons for dress and decorating. The earliest pieces were novelties that arrived with the much desired and very profitable spices from the West Indies early in the 17th century. 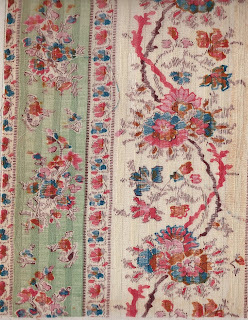 Soon EIC officials were sending design/color ideas to the Indian craftsmen, lighter backgrounds and examples of familiar European floral motifs. Calicos and chintzes, usually hand painted, flowed into England and on to the American colonies. The 'pieces' were made into European style garments. Three particular articles of Indian dress were incorporated into European fashion: the banyan, the sari and the Kashmir shawl. 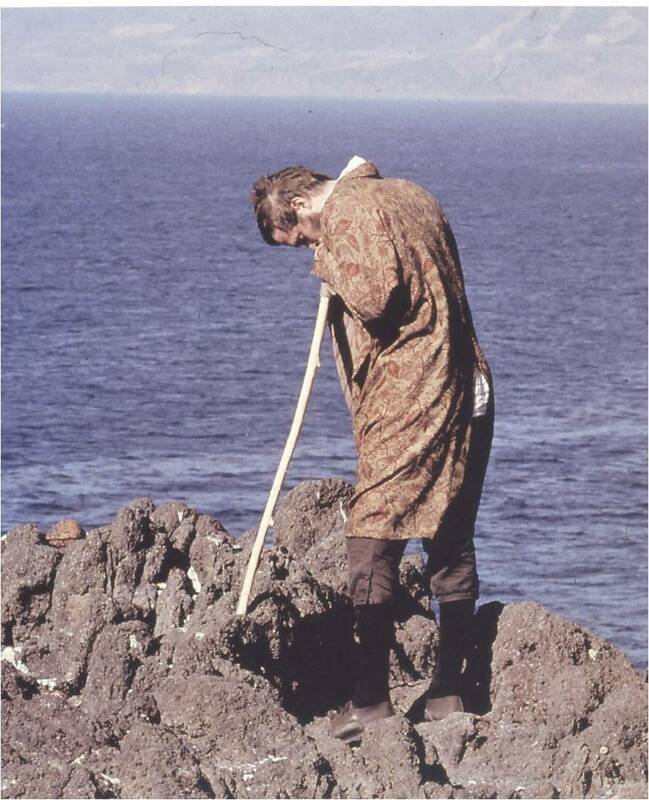 The banyan was a man's loose robe constructed in a simple 'T' shape. A scene from Masters and Commanders.